OTTAWA – June 13, 2017 – Energate Inc., the leader in ZigBee SEP interactive energy management solutions that enable the Utility Internet of Things (IoT) next-generation energy management and the connected home, will supply Pacific Gas and Electric Company (PG&E) with load control switches for the next phase of the company’s SmartAC™ program. 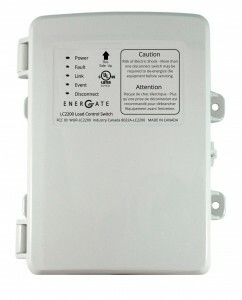 Energate will deliver its LC2200 load switches using the secure ZigBee Smart Energy Profile providing two-way communications via PG&E’s existing ZigBee enabled meters. The LC2200 delivers both control and insight into load shedding events and is a significant advancement of Demand Response and Direct Load Control technologies. The LC2200 includes advanced internal sensing to capture real-time information including LC2200 availability, load running status, event execution, and relay status. Knowing the availability and operating status of loads captures the full value of demand response resources that utilities and independent system operators are increasingly relying on to cost effectively manage the balance between generation and load. The LC2200 incorporates Energate’s patent pending OptiCycle™ technology, assuring each load is reduced fairly and proportionally, minimizing the overall impact on comfort for all participants. The easy-to-install LC2200 has an integrated junction box, options for control of both low voltage and line voltage circuits, ability to control up to four loads, and power measurement options. In addition, for the consumer it can be scheduled for energy efficiency, and respond directly to electricity price to save money. Energate Inc. provides interactive energy management solutions that enable next-generation energy management and the connected home. Energate’s vertically integrated Consumer Connected Demand Response™ platform provides management of two-way communication and demand response events through a flexible solution that includes devices, middleware, and applications. Energate’s Internet of Things solution is an interoperable architecture that has been proven in the homes of many North American utilities’ customers. OTTAWA – August 29, 2016 – Energate Inc., a leading provider of interactive energy management solutions that enable next-generation energy management for the Utility Internet of Things (IoT) and the connected home, has been selected by Pacific Gas & Electric (PG&E) to explore a new two-way direct load control solution technology for residential customers. The technology assessment, already underway, will measure the load reduction values of multiple technologies including Energate’s recently introduced LC2200 Load Control Switch. The technologies are installed in a small sample of existing residential customer’s homes and leverages PG&E’s AMI network. Energate’s LC2200 Load Control Switch will add two-way communications utilizing the existing ZigBee enabled meters for control and insight into load shedding events and represents a significant evolution in DR technology. 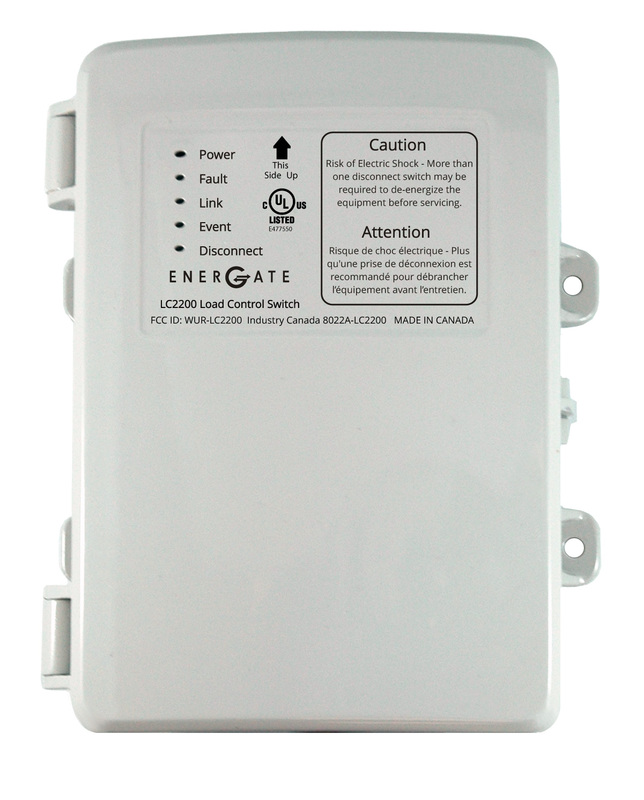 The LC2200 uses secure and reliable ZigBee™ Smart Energy for two-way communication and works on PG&E’s current AMI network. Advanced sensing inside the switch along with two-way communication provides near-real time information, including confirmation of LC2200 availability and statuses like load running state, event execution progress, and relay state. Knowing the availability and operating status of loads captures the full value of demand response resources that utilities and independent system operators are increasingly relying on to manage the balance between generation and load. Assuring load reduction values even if oversized or undersized air conditioners are installed is made possible through Energate’s patent pending OptiCycle™ technology which will be utilized during the pilot. OptiCycle assures that each load reduces fairly and proportionally, minimizing the overall impact on comfort for all participants. The technology assessment’s final evaluation report is expected in October 2016. Energate Inc. provides interactive energy management solutions that enable next-generation energy management and the connected home. Energate’s vertically integrated Consumer Connected Demand Response™ platform provides management of two-way communication and demand response events through a flexible solution that includes devices, middleware, and applications. Energate’s Internet of Things solution is an interoperable architecture that has been proven in the homes of more than 40 North American utilities’ customers. OTTAWA – February 16, 2016 – Energate Inc., a leading provider of interactive energy management solutions that enable next-generation energy management for the Utility Internet of Things (IoT) and the connected home has been working with PowerStream to deliver the first of its kind in Canada, a Customer Opt-in Dynamic Pricing (CODP) program for residential customers – providing significant savings to the grid and to customers. The success of the pilot prompted PowerStream to launch a second pilot to evaluate CODP impact during the next two seasons (winter & summer 2016). Approximately 500 new participants were enrolled for the winter and 300 more customers will be enrolled for the summer of 2016. With a second summer, additional data on a larger number of customers will further validate the value of this innovative program. The summer 2015 program was delivered with support from the Ontario Ministry of Energy’s Smart Grid Fund and Energate. Advantage Power Pricing (APP), as named by PowerStream, was a voluntary, dynamic pricing program for residential customers. Customers who took part in the pilot paid a very low price for off-peak energy use (4.9¢), while their peak use from 3:00 to 9:00 p.m. on weekdays varied between one of three rates (12¢, 24¢, and 48¢), based on actual provincial electricity demand. When demand was extremely high, critical peak price events took place at 60¢ per kWh. Customers paid the lowest, off-peak, rate over 80% of the time. All participants in the first pilot received technology – Foundation Smart Thermostat and Home Energy Gateway, mobile apps, and ZigBee-enabled smart meter – and information to adjust their consumption in response to daily electricity demand. On average participants received an $80 cheque that represented their savings DURING THE SUMMER PERIOD compared to Time–of-Use (TOU) rates. With 1053 people participating, peak electricity demand decreased by approximately 1 MW. Customer Opt-in Dynamic Pricing can be implemented at any Local Distribution Company. As with TOU rates, dynamic pricing has the potential to benefit microgrids, Conservation and Demand Management, Demand Response, energy storage, and further development of in-home tools for customers. PowerStream is a community-owned energy company that provides power and related services to more than 375,000 customers residing or owning a business in communities located immediately north of Toronto and in Central Ontario. An innovative pilot being run by PowerStream is providing participating customers with a dynamic new way of managing their electricity costs – one with the potential to provide significant savings to the grid and to customers. Participants are being given the information and tools they need to adjust their electricity consumption and costs in response to actual provincial electricity demand on a given day. Supported in part by the Ontario Ministry of Energy’s Smart Grid Fund, and Energate Inc.’s Consumer Connected Demand Response platform, Advantage Power Pricing is a voluntary and dynamic pricing program for residential customers. Customers taking part in the pilot will pay a low price for off-peak energy use, while their peak use, from 3:00 – 9:00 p.m. on weekdays, will vary to one of three rates, based on actual provincial electricity demand. Prices will be finalized in mid-April but are estimated to be 5¢ for off-peak prices, and 10¢, 20¢ and 40¢ for the low, medium and high prices respectively. Customers will pay the lowest rate over 80% of the time. Customers will be notified daily of the demand-based price that will apply during the next day’s peak period, and given the opportunity to shift their consumption away from higher-price periods to lower-price periods. This shifting of consumption enables customers to better manage their electricity costs while at the same time helping to further reduce the strain on the province’s electricity grid. And it will do so in a more precise way than existing time-of-use pricing programs alone can achieve. If this program moves beyond the pilot stage and becomes available to a larger number of customers, it will help to reduce the need to build costly new power plants. Customers who register in the program are equipped with an Energate Foundation™ Smart Thermostat and Home Energy Gateway, which give them access to up-to-date pricing information and then respond to price changes – intelligently, automatically and according to the customer’s preferences. The thermostat can respond to price changes by increasing the temperature to which the house is cooled, and can even pre-cool the home to limit consumption during peak times. For customers with electric water heaters or pool pumps, load control switches can also control these appliances to further reduce electricity cost during peak times. The customer is always in charge of their energy consumption, and can even change settings and view consumption from anywhere through web and mobile applications. PowerStream is the first distribution company in Ontario to offer this innovative pricing plan to its customers. The project is intended to test out the customer appeal and electricity savings provided by the pricing plan in combination with new technology It is hoped that this pricing plan will later be made available to all PowerStream customers, and to customers of other distribution companies across Ontario. The pilot will wrap up later this year, with results published in early 2016. As of mid-March, PowerSteam was approaching its target to recruit 1,000 participants for the trial. PowerStream is a community-owned energy company providing power and related services to more than 370,000 customers residing or owning a business in communities located immediately north of Toronto and in Central Ontario.